Hi, Victoria Coe! Happy New Year! Welcome back to Watch. Connect Read.! What have Fenway and Hattie been UP TO since the last time you visited? Victoria J. Coe: Happy New Year to you, too, Mr. Schu! What an honor to be back with you for another visit. Many thanks for hosting me today! My gosh, since we were last with you this little dog and his favorite short human have been on the move! Thanks to the 2017 Global Read Aloud, Fenway and Hattie have met thousands and thousands of readers in classrooms all over the globe. They inspired artwork, writing, STEM projects, drama, digital creations, even a song and an on-line game! What should everyone do before pressing PLAY? Victoria: Well, everyone should get ready to join the party! 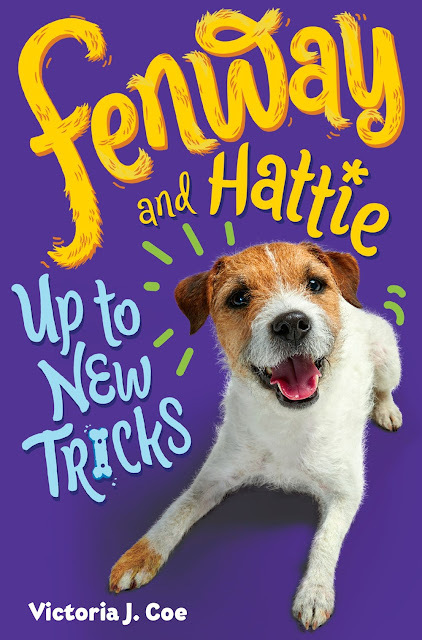 I’m so grateful to Fenway’s buddies – big and small – who are here to help celebrate the third book in this series, FENWAY AND HATTIE UP TO NEW TRICKS. And when everybody’s finished watching the trailer, they can pick up a copy because it’s out now! What was the most exciting thing about Fenway and Hattie’s being a 2017 Global Read Aloud selection? Victoria: Paws down, the most exciting part of the GRA for me was interacting with so many incredible teachers and their awesome students. It was an enormous privilege to listen to their thoughts and ideas, witness their inspiring discussions, and connect with them via weekly Q&As. The whole experience was mind-blowing. Teachers are already my heroes, and the teachers who spent their time, energy, & creativity to make the GRA such a huge success are my SUPERHEROES! Dogs are familiar and accessible – that is, they live with us in our world. That’s why I love to use dogs as a way to invite students to explore another point of view. Dogs experience many of the same things that we do, but their take on them is very different. Realizing that there isn’t one “right way” to view something - that your reality depends on your POV - is life-changing, and one of my personal fascinations. Mr. Schu, you should have asked me about the FENWAY AND HATTIE resource padlet. It’s a comprehensive one-stop-shop for all things FENWAY AND HATTIE. I hope readers will check it out! Borrow Fenway and Hattie Up to New Tricks from your school or public library. Whenever possible, please support independent bookshops.